The goal of General Studies at KYHS is for students to broaden and deepen their understanding of the best that the world of knowledge has to offer while developing the skills and passion for lifelong learning. KYHS offers courses that aim to challenge each student at a level that is most appropriate for him or her. We offer Advanced Placement (A.P. ), honors, accelerated, grade level, and principle courses. The staff members in each department coordinate their teaching with each other so that themes are reinforced in each class. Each student takes a core course in English, History, Math, and Science each year as well as an Elective course. Our challenging and extensive General Studies program provides a solid foundation for understanding our world and prepares our students for the various post-high school academic institutions they attend. explore a myriad of subjects at differentiated levels. wide-range of interactive virtual laboratory experiments. discover and understand the biological world around us. data, and then draw conclusions from their findings. energy, power, kinematics, mechanical waves, and sound. realize the depth and breadth of our oceans. Science studies depending on their areas of interest. Students benefit from the wide spectrum of Math courses available, ranging from Principles to Advanced Placement. 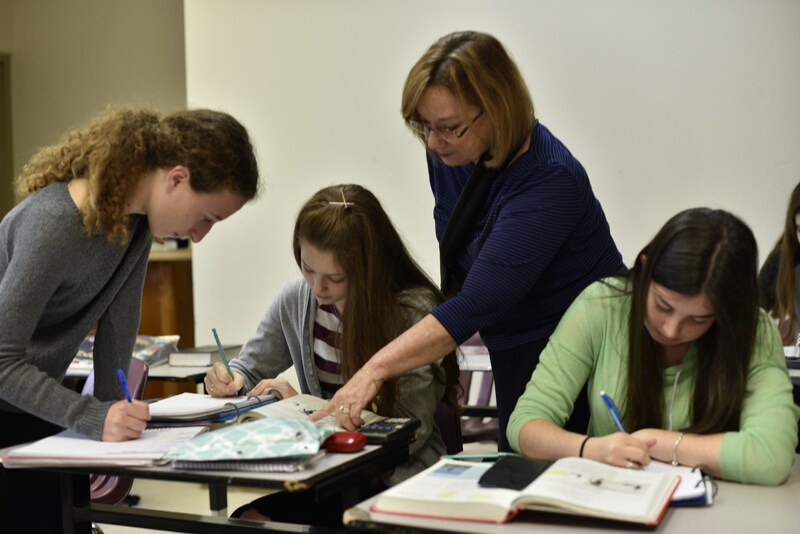 The Math department focuses on critical thinking, data analysis, computation skills, and interpreting and modeling graphic representations of complex and abstract figures. The curriculum also emphasizes the integration of STEM skills including the mastery of the use of graphing calculators to prepare our students for the technology of the 21st century. While top math students typically graduate high school having studied the equivalent of 2 semesters of calculus, we currently have students that will complete calculus III. Students are encouraged to appreciate the value and relevance of math skills in their academic life and beyond. 9th grade: Freshmen begin their studies with the spatial-visual studies of Geometry. Geometry is offered on multiple levels, catering to the student's Algebra background and skill set. Students who will benefit from an Algebra I course prior to studying Geometry will begin high school Math with Algebra I and defer Geometry to sophomore year. 10th grade: Sophomore year is spent honing the skills of Algebra I/II, while a smaller group moves onto Pre-Calculus. Algebra skills are the foundation on which all future math classes build. The majority of our students, by the end of 10th grade, will have covered most of the Math required for their junior year SAT and ACT standardized exams. 11th grade: Between Algebra II and Pre-Calculus, most of our juniors are setting the stage for more advanced levels of Mathematics. Students constantly spiral back to concretize the basic fundamentals of Algebra while being challenged to apply their knowledge to real-world scenarios. Our top math students elect to study the AB portion of Advanced Placement Calculus, the equivalent of first-semester college Math. 12th grade: The majority of our students take Pre-Calculus or Calculus in their senior year, in classes offered on various levels. Students who choose not to avail themselves of this level of rigor have alternative options including, but not limited to, Trigonometry, Statistics, and Math for College Readiness. Our top math students elect to study the BC portion of Advanced Placement Calculus, the equivalent of second-semester college Math. In History classes, students learn to think, converse, and write critically as they integrate the study of History with current events. Students become proficient at analyzing documents, pictures, and other primary sources while developing the skills necessary to interpret historical trends and important world issues. 9th grade: In their study of Human Geography, students consider the physical geography, distribution, processes, and influences of the earth as well as human interaction with the environment and the people around them. Studying in classes ranging from Principle to Advanced Placement, students are exposed to numerous economies, political systems, and social traditions that differ from those of America; students’ thinking expands as they compare the cultures they are familiar with to those they have never studied before. In addition to analyzing texts, students learn how to use and interpret maps, graphs, and photographs as they make connections between cultures and the regions that influence them. 10th grade: In the study of European History from the year 1450 to the present, students learn about the cultural, economic, political, and social developments that have shaped today’s world in classes ranging from Principle to Advanced Placement. As they explore the major themes of European History, students analyze historical evidence and write interpretive essays on relevant historical developments and modern-day issues. Through historical document analysis of authentic sources such as Martin Luther’s 95 Theses and Machiavelli’s “The Prince”, students further strengthen their critical-thinking skills. 11th grade: Students in eleventh grade begin their study of American History in pre-colonial times, in a range of levels from Principle to Advanced Placement courses. Thanks to an emphasis on current events, students recognize how America’s past directly affects its present. Using themes and skills developed in their study of European History, students use highly developed critical-thinking techniques to delve into historical perspectives on numerous topics, including influential court cases, the role of the Federal government, and recurring human issues. Analyzing documents, speeches, and other critical historical data, students learn about the priorities and considerations that influenced America’s initial development as well as its foreign and domestic policies over time. 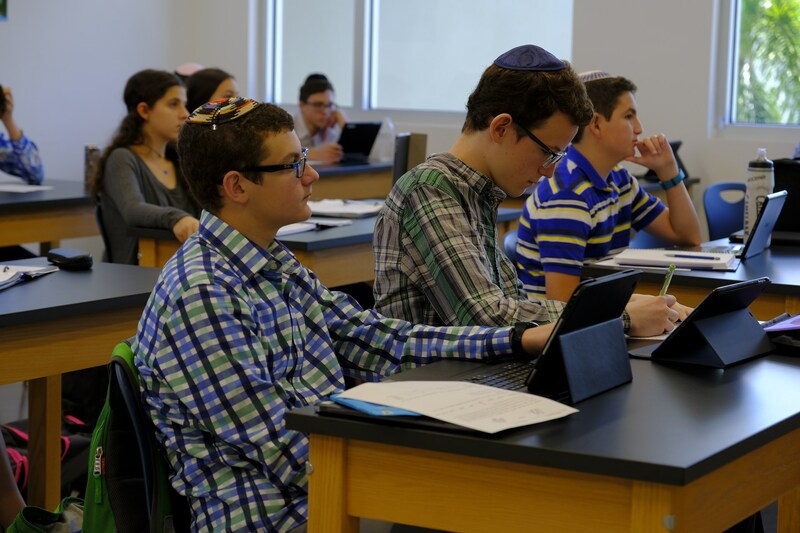 12th grade: As seniors, students learn History in a more collegiate atmosphere with the opportunity to delve deeply into specific subjects as they rotate through seminars in the following content areas: Zionism and Modern Israel, Jewish Modernity, Jewish Thinkers, and the Holocaust. As seniors, students are challenged to study more complex content and ideas that they are now mature enough to comprehend, interpret, and appreciate. 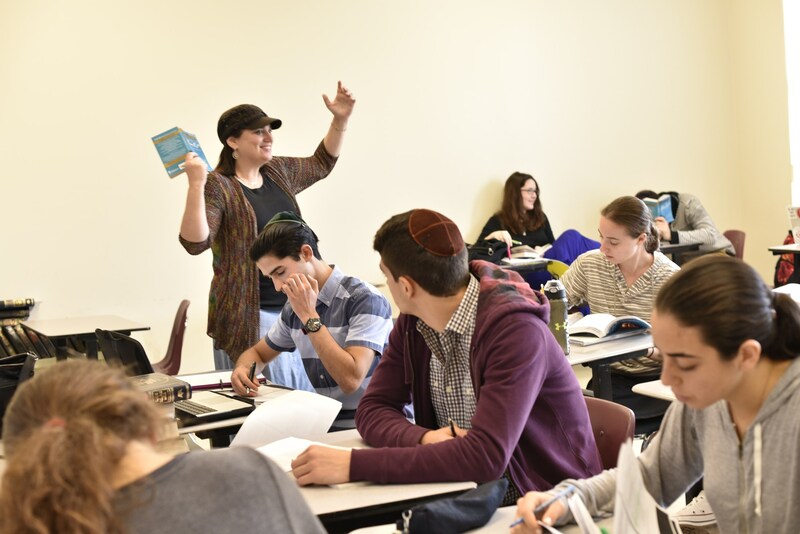 Students may elect to challenge themselves with the honors curriculum which entails writing an extensive research paper on any Jewish History topic as well as attending a weekly seminar in which they debate controversial issues in the Jewish community. In English classes, students become proficient writers and sensitive readers. Through survey classes and genre studies, students experience the top modern and classical texts of the Western canon while expanding their world-views and ultimately learning about themselves. 9th grade: Students transitioning into our high school focus on developing strong writing and analytical skills. Beginning with an intense composition unit and working through classic literary archetypes and genres, students develop the basic skills needed to explore deeper and more complex texts. In addition to short stories and poetry, larger works include: The Book Thief, Fahrenheit 451, The Curious Incident of the Dog in the Night-Time, Antigone, Macbeth, and Ender's Game. 10th grade: Building on the skills learned in their freshman year, students in tenth grade begin stateside for an intense American literature survey course. Studying classic authors from Poe and Hemingway to Twain and McCarthy, students explore the evolution of American creativity and the ever-changing American Dream as experienced by some of the greatest authors, poets, and orators of the past 200 years. 11th grade: Junior English takes the students back to the beginnings of the English language with an in depth survey course of British Literature. Starting with Anglo-Saxon ballads and finishing with modern British voices, students participate in the pageant of British literature and learn how it has shaped our language and culture on this side of the pond. Major works include Beowulf, The Canterbury Tales, King Lear, and Brave New World, as well as numerous short stories and poems. Students in 11th grade may also opt to take AP Language and Composition instead of British Literature. 12th grade: A new initiative in the English Department allows seniors to choose their English classes for their final year of high school. With multiple different courses available, students get a small taste of what college classes will be like. Students switch classes mid-year in order to experience different genres and topics in literature, taught by teachers who are passionate about their subjects. Sample courses offered: AP Literature and Composition, AP Language and Composition, Villains and Monsters, Science Fiction, Shakespeare, Contemporary Literature, The Graphic Novel, Satire and Comedy, Children's Literature and Fairy Tales, and Crash Course Literature.